The report titled 'Global Pulse Oximetry Market: Trends and Opportunities (2013-2018)' provides an insight into the market dynamics and various trends and opportunities associated with the global pulse oximetry market. The report analyzes the global market size and growth dynamics of the pulse oximetry market in the past five years. The report further forecasts the market size for the coming five years along with factors that could influence the market dynamics in the projected period. Also captured is the market share based on major players in the market. Further, the report analyzes the domestic pulse oximetry market of the United States and Europe. The report concludes with a brief discussion of key factors driving the global market and profiles major players like Covidien, Masimo, Smith Medical, Carefusion and Nonin Medical. The pulse oximetry market which consists of pulse oximeters and consumables and equipments has witnessed sutained growth over the last few years. The market is governed by the changing technology and growing awareness of convenient and cost effective products and disposables. 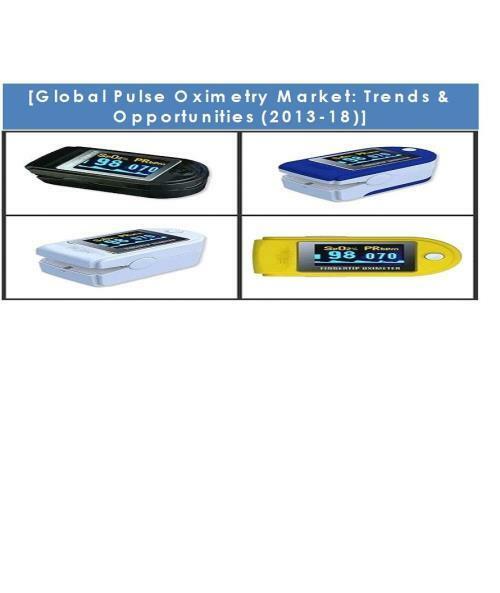 In addition to it, the growing aging population and rising incidence of heart diseases and respiratory failures, changing demographics and lifestyle has also influenced the dynamics of pulse oximetry market. Recently, Masimo one of the leading companies in pulse oximetry market announced the launch of iSpo2 pulse oximeter for iphone, ipad and ipod touch in Japan. The growing demand of portable and miniature size pulse oximeters in the market has revolutionized the overall pulse oximetry market. Today, consumers are going for more handheld, easy to carry and wireless pulse oximeters. To address this segment of the market, few iphone enabled pulse oximeters like Zensorium's Tinke and Masimo's iSpO2 has hit the market. The report provides an insight into the market dynamics and changing trends in the global pulse oximetry market. The report covers the actual and forecasted market sizing of the global pulse oximetry market and also outlines the various factors fuelling the demand of the same. It further captures the global market share based on the segment and major players in the market. Further, the report discusses the domestic market of United Sates and Europe. It also focuses on the various trends that are currently dominating the global pulse oximetry market.